Report by Amy and Aiden. 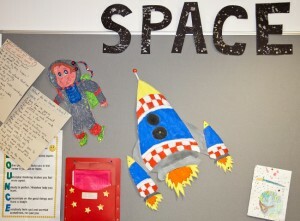 P1b are learning all about Space. They have really enjoyed making spaceships and planets. In maths they have learned how to subtract, well done to them! Katie and Lucas participated in a sports camp over Easter. They were pleased to report that they won a medal and trophy. P1c have been busy learning about Spring and the things that are born in Spring! After the Easter holidays they wrote about all the exciting things that they did over the holidays. They have also been learning to count up to 20 and add and subtract up to 10! For the first time ever this year they used the parachute in gym and enjoyed learning how to skip and keep control of the ball. P1d have also been learning about Space and about our planets. They have been practising their handwriting and it is looking really good. They have learnt about addition in maths and they have been learning about what makes a good friend. They enjoyed their spring walk at Kelvingrove Park. This term P2a have been up to all sorts. They have been on a bird watching trip with the RSPB. The bird watching trip has inspired them to have their very own bird watching station in their class. At Easter P2a did the Easter assembly for the lower school and it was very enjoyable. At playtimes and lunchtimes P2a have been learning how to skip. They have starting to bring in their own skipping ropes. There is a Bey Blade station at the corner of the lower schools playground and P2a have been enjoying that so much! P 2b have been learning about time, money and numbers in maths. For topic they have been learning about birds and different kinds of animals you can find in the park. They went to Kelvingrove park and Kelvingrove museum and learnt about Lars Pepe. In gym, P2b played basketball and tennis and sometimes played outside when the sunny weather was here. During the holidays Calum went to England and drove a motor boat. Well done P2b you have worked very hard!!! P2c have enjoyed their topic “The Park” very much. They went on a trip to Kelvingrove with RSPB and they saw lots of different birds. Natalie had a win on the Grand National… good for you Natalie! P3a have been very busy. They have been learning how to send messages and e-mails on computers in ICT and they have also learned how to use speech marks. They went to the Mitchell Library and met Ally Sparks a famous writer and she read one of her books to them. They have been learning about Islam and Christianity. Outside of school Jessica did her 1st level in gymnastics and her 4th level in swimming. Primary 3b are working on some really amazing and interesting topics like some crazy ways to cross the Clyde! They have some very modern looking skyscrapers outside their classroom. We asked them about achievements outside of school, Joey and Atoub plus many others won swimming badges Mia won five racing medals. Katie won a medal for gymnastics, two skiing badges were won and one resulted in a broken leg, uh oh! Mia and Stina raised money to save the wonderful pandas! Great Work p3b! P3c have been working very hard this month doing a lot of writing and poems, they also went to the Mitchell Library to visit an author called Ally Sparks. They wrote Easter poems and they were all very good and their teacher became a dad again – congratulations! P3d have been working very hard this term on lots of exciting activities! Luca, one of the pupils in p3d won a trophy out of school at football. P3d were a great help at the Fairtrade parade. At the school opening one pupil from the class that represent the pupil council helped out in the school opening. They also labelled all the seed packets to each class in the school and they organised a pencil for every child in each class as well! Well done! P4a have been very busy. P4a have been learning Russian. They have created their own cartoons, based on the Mash Up books having visited the authors at the Mitchell Library. They have also written keyhole stories. They were involved in science experiments at Glasgow University. They went to Kelvingrove Art Gallery and Museum to an AC/DC exhibition as finale to their topic. They have a dance specialist in during PE. Very well done! P4b have been very busy this month with 2 trips; a science fair at Glasgow University and the Mitchell Library. They had a ‘Russian taster‘ from a teacher from the University. Children have also been winning loads of medals outside of school for swimming, football and even ran the famous ‘Sport Relief Mile’! P4b have also finished their topic: Scotland on Tour and have now started The Vikings. The girls of P4b have started a writing club and have written a book each, some girls were even on their second! We are pleased with P4b’s progress in the new school. P4/5 never seem to stop working; they’ve made some amazing cardboard ski land resorts. They got to learn more and more about Scotland, and even did something special for Easter. P4/5 got to decorate a lot of things, such as eggs, bookmarks and sports clothes for their skiers. Many of the children said that their new topic, which is coming up, will be Garden Detectives. This class really doesn’t seem to stop working hard! Primary 5a have been really busy lately, with Bands on Tour where they made up their own fantastic songs and then performed them on the last day of school. They have been on loads of trips too, the Science Centre to see Hubble 3D, they told us that their favourite exhibition was the Alice in Wonderland, they also went to see the great author Mr.Newbound at the Mitchell Library, then to the Mosque to look inside and learn about going there. They also went to Irish dancing lessons and won a trophy at a festival. Well done p5a! P5b had a lot to do before the holidays, Bands on Tour, is probably the most exciting topic we’ve heard about. It wasn’t all just work; P5b got the opportunity to go on a class trip to the Science Centre. Easter was a definite bonus to this busy class, they got to make bunnies for Easter they all seemed really keen on talking about the bunnies. In the Science Centre they told us about how they met Andrew Newbound, who told them about dangerous words. They all said “Hugga Bugga” was a highly dangerous word. Fantastic work P5b! P6a have been very groovy this month! Dance trophies won outside of school and joined with p7 for a Zumbathon (Zumba marathon for kids) they were fantastic and really enjoyed it. They have been on various trips including; a fabulous performance of Hansel and Gretel at the Citizens Theatre, Parasites Workshop at the University, Real Glasgow– Victorian workshop at the art galleries, and a trip to remember to Scotland Street School! 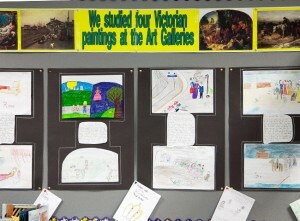 This was to help P6a learn more about their topic: The Victorians. They have been very enthusiastic this month! P6b are working really hard on the Victorians topic! They have been learning all the street names in the Victorian times. Due to Victorian topic they went on a trip to Scotland Street which they enjoyed very much. They made crowns for Queen Victoria because of their topic. During the Fairtrade Parade they were chanting all the time and very enthusiastic and had an excellent time! P7a have enjoyed learning about WW2. They have also done an assembly based on the Clydebank Blitz. They have been learning Mandarin and all are really enjoying it, they are thinking about taking Mandarin next year at Hillhead High. They have done lots of interesting thing like Lindy Hop Dance and also took part in the school opening which they are very proud of. P7b recently finished the novel Goodnight Mr Tom by Michelle Magorian. P7b has also very busy with their topic WW2. They have been involved in an extensive array of different activities from learning Mandarin to practising Ceilidh dancing; from learning rugby and cricket to learning about art through their visit to The Essence of Beauty, 500 years of Italian Art at Kelvingrove Art Gallery. Culture and Class! P7c have had lots of fun on their topic WW2. Before the holidays they took part in Ration Day they had to research WW2 recipes and make them from weekly rations! It was yummy….! They also took part in a Lindy Hop competition, everybody in the class performed very well – creating their own version of the dance. Alice and Amy were our overall winners and won a box of chocolates! Well done to them! P7c have been learning Mandarin, not only learning the language but also finding out about the wonderful culture of China! P7c have also been learning French! P7c were involved in a huge Zumbathon as a special treat to celebrate the opening of the school! And finally our Pupil Voice Committees have their say…. The Eco Committee has been very busy this month. We have organised all recycling boxes – making sure that every classroom has paper and plastic recycling bins. The committee has been promoting the use of the recycling points around the school, making the children aware of the importance of ensuring our playgrounds are environmentally friendly. During this week the committee will be involved in Hillhead Primary’s first baseline review. Good Luck to them! Pupil council members have been involved in lots of important activities. During the opening ceremony we were all asked to make a small speech about our wonderful new school. Pupil council reps were also involved in creating a menu for our Celebration Lunch… it was very tasty! The Fairtrade Committee was recently congratulated with a certificate of appreciation by the One World Shop for raising £843.19, what an amazing result! Thank you to all the pupils and parents who took part in our Fairtrade Fortnight, we certainly have taken a Step For Fairtrade! Last Friday we had another of our famous Fairtrade Café afternoons! It was great fun, lots of yummy cakes and snacks were enjoyed! Lots of parents and family members came along to the café, it was a fantastic atmosphere!